After making these, I knew I wanted to make more… bigger badder treats. 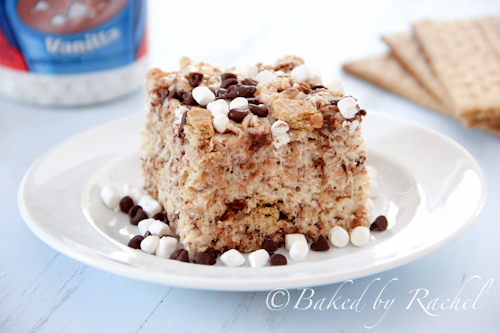 Think old school camping treats mashed together to create a bite full of awesomeness. 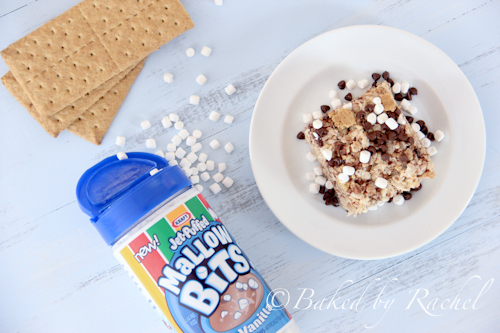 What kid doesn’t like rice krispie treats and s’mores? I dare you to find just one. It’s a perfect combination. Two kid favorite treats blended together into one glorious creation. It happened. It had to. I made these over the weekend and I’m almost ashamed to admit that my family devoured them already. It means they’re that good! And that you have to make them. 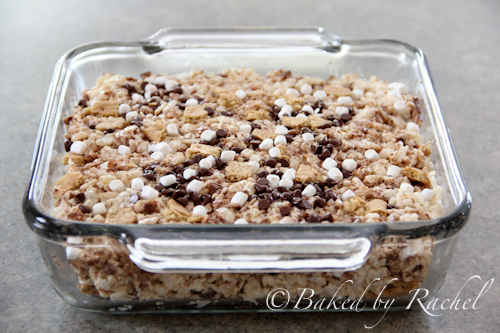 All the traditional flavor of both treats, marshmallowy rice krispies with bits of graham crackers, mini marshmallows and chocolate chips tossed throughout. You won’t be able to eat just one. Promise. This time I used a square baking dish instead of a rectangular one because I wanted super thick squares. You can opt to make these in either size dish to suit your own preference on thickness and depending on how man you’re trying to serve. Break graham crackers up into small pieces, but not crushed. Remove a small portion (roughly 1/4) of the mini chocolate chips, mini-mini marshmallows and graham cracker pieces to a separate bowl. Set aside, reserving for topping. Melt butter in a large stockpot over medium heat. When butter is melted, add the bag of mini marshmallows. Stir constantly while marshmallows melt. When mixture has fully melted add cereal. Stir to coat completely. 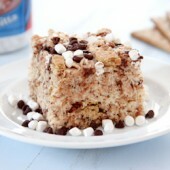 Add graham crackers, chocolate chips, and mallow bits. Stir until dispersers throughout. Spoon mixture into an 8x8 or 9x13 glass baking dish. Spray hands with baking spray, spread mixture evenly throughout baking dish. Sprinkle with reserved toppings and press down gently. Let sit for at least 30 minutes before cutting into squares. Love the addition of the graham crackers! fun twist on the traditional rice krispie treats – they’d be great to bring to a kids summer sleepover or campout, as they have such a summery feel. fun! 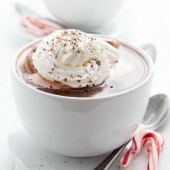 I’m a fan of anything involving chocolate and marshmallows. 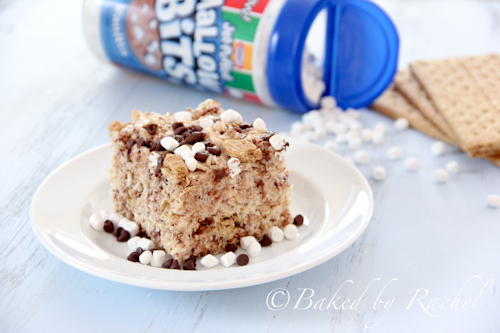 How can a s’more krispie treat be wrong? 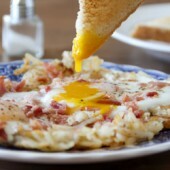 :) Looks so yummy. So fun! I always debate buying those teeny marshmallows and I guess I need to do it now! I’ve only seen then at Target so far. I’ve seen people post pictures of other flavors too! Fun! I’ve never seen these marshmallows… Will need to check target! I just love how thick they are! I’d make them in the same size pan so mine would be tall too! That is BY FAR the best rice krispies treat I have ever encountered. Love these, great flavors! I need to get those mini marshmallows. I have been trying to avoid them at the store. You had me at S’mores. These look so good! I can’t wait to try these. I need to buy some of those mini marshmallows – so cute! Love this idea! My little girls would love these. Perfect treat for a bbq. 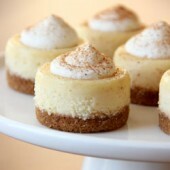 Thanks for the inspiration…by far my favorite dessert!